So, THIS is how they make Marshmallow Fluff!! 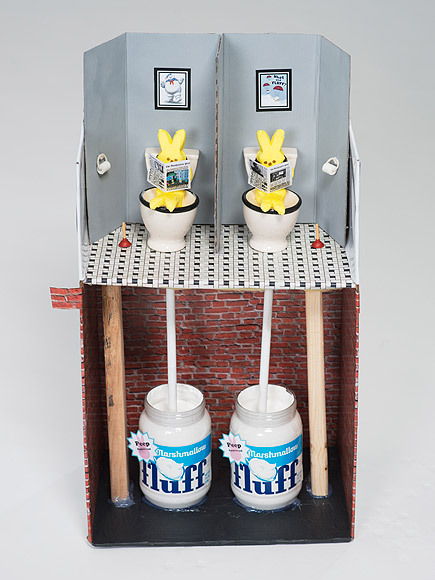 For the 2014 Peeps Diorama contest held by the Washington Post, Washington-based Kate Hohman submitted Everyone Peeps a scatological-themed diorama showing two Peeps sitting on the john, “pooping” marshmallow into Fluff jars. Its title is inspired by the kids’ book, Everyone Poops. 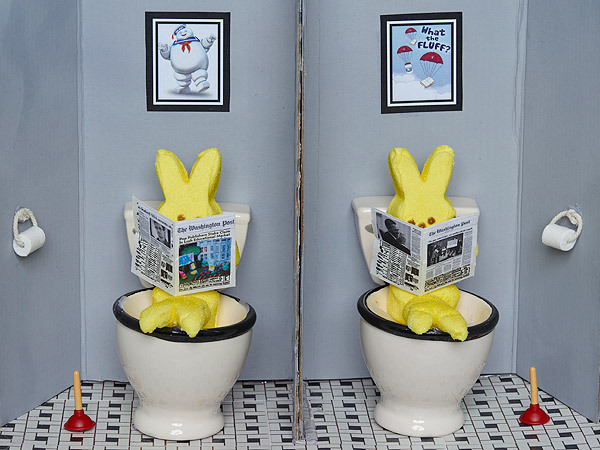 Look closely, the Peeps are reading tiny versions of The Washington Post. Above one of them is a mini-framed portrait of the Stay Puft Marshmallow Man from Ghostbusters, and above the other is art from the What the Fluff? festival in Somerville, Massachusetts. @Blazenhoff lol "marshmallow fluff is PEEPLE"
Check out the other dioramas in the contest HERE.